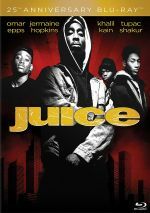 When Juice hit screens in 1992, some critics disliked it because it strayed from the normal “tough life in the hood” form of drama popular at the time. To be certain, much of the film presented existence in Harlem along those lines, but as the movie progressed, it became more traditional, with much of the final act worked more like a film noir or a thriller. I saw the movie during its theatrical run and I rather enjoyed it, largely because it offered something different. I liked the fact it seemed to view itself as a fictional movie and not a documentary. 25 years later, I feel less enthusiastic about the film, though. Juice tells the story of four teens who don’t act well - they frequently skip school, they shoplift, they smoke and drink - but who haven’t become actual thugs. This changes when the group’s two leaders - Raheem (Khalil Kain) and Bishop (Tupac Shakur) - decide they should rob a local convenience store. Steel (Jermaine “Huggy” Hopkins) probably doesn’t want to become a true criminal, but he’s too wimpy to go against the flow. Q (Omar Epps) puts up the most vocal resistance to the plan, but not because he seems opposed to robbery. No, he just has a DJing contest in which he needs to participate the night of the planned heist. Unfortunately, Q decides to go along with the activity, and all goes well until Bishop shoots the store’s proprietor for no apparent reason - other than the fact he’s a psycho, that is. After that, the situation rapidly declines as Bishop loses his already-tenuous grasp on reality and he buys into the “thug life” myth big time. Juice remains fairly entertaining, but it contains a few problems. For one, we never get a really good feel for the kids. They all appear fairly aimless though nice, but that’s about it. We see a hint of domestic problems in Bishop’s home through a quick view of his vegged-out father, but this aspect of his life never gets explored. We also feel as though Q boasts the most potential, but that’s just because he fits that slot in the movie mold. These kinds of stories always include the smart one who’s on the rise, and Q best meets the criteria, though it’s unclear if his hoped-for DJ career will get him anywhere. At its heart, Juice wants to provide social commentary, as we’re supposed to see the respect and authority gained by anyone with “juice” – ie, power and dominance. In a way, the movie comes across as a slam on peer pressure, since it’s that form of influence that causes a lot of the negative actions. The main problem with its arguments stem from the fact that only one participant - Bishop - really goes over the edge, and his issues seem a lot deeper than simple peer pressure. He’s clearly a nutbag and he likely would have exploded even without the pressures of urban life and his easy access to guns. Juice marked the directorial debut of Ernest R. Dickerson, Spike Lee’s longtime cinematographer, and it bears the mark of someone with visual strengths but without much storytelling skill. The film looks quite good, as Dickerson creates a moody and atmospheric appearance to the setting. It’s a nicely-composed effort that works best as a thriller. As far as the acting goes, Tupac established himself as a real cinematic presence with his work here. Perhaps his scary attitude seemed less surprising when we later learned of his shadier dealings - when Juice arrived, Tupac was a virtual unknown - but he still inhabits the creepy world of Bishop effectively, so his spooky performance easily becomes the best part of the movie. The others present varying degrees of decent work, but none of them stand out from the crowd. They come across as competent and that’s about it. Juice isn’t a bad film, but it’s a muddled and mediocre piece that tries to span two genres and fails. It doesn’t satisfy as a thriller, and it doesn’t work as a “true-to-life” examination of ghetto life. The movie occasionally sparkles due to a self-assured and scary performance by Tupac Shakur, but without him, the picture would have been forgotten long ago. Juice appears in an aspect ratio of approximately 1.85:1 on this Blu-ray Disc. I felt pleased with this high-quality transfer. Overall sharpness seemed good, as the majority of the movie provided nice delineation. A few low-light shots appeared slightly soft, but definition seemed strong most of the time. I saw no jagged edges or moiré effects, and the presentation lacked edge haloes or print flaws. Colors worked nicely, as the movie’s natural palette came across well. The hues showed nice vivacity and range. Blacks were dense and tight, while shadows usually seemed positive. As mentioned, a few darker shots came across as a little thick, but these elements mostly appeared solid. Only the minor softness kept this fine transfer from “A”-level consideration. Not surprisingly, music dominated the DTS-HD MA 5.1 audio, and the track featured a strong forward bias, so the front speakers received the lion’s share of the work. The songs presented fairly solid stereo separation and created an effective auditory environment, but they didn’t get a lot of help. Dialogue was firmly anchored to the center, and while some effects cropped up on the sides, the impression didn’t seem terribly lively. Surround usage also was largely restricted to music, as the rears offered good reinforcement of the tunes throughout the film. A modest amount of effect activity also emanated from the surrounds, but not much. It’s a pretty restricted track, though it works acceptably well for the material. Audio quality sounded fairly solid. Dialogue appeared distinct and acceptably natural, so I noticed no signs of edginess or any problems related to intelligibility. Effects lacked much impact, but most of these components were adequately reproduced, and I detected no concerns related to distortion. The music became the best part of the track, as the songs sounded clear and bright, and they frequently presented some nice bass; Juice offered tight and deep low end throughout the film. This never became a great mix, but it worked well enough for an age-related “B”. How did the Blu-ray compare to the original DVD from 2001? Audio seemed warmer and more dynamic, while visuals appeared clearer and better defined. The Blu-ray provided a substantial upgrade, mainly in terms of picture quality. Whereas the DVD included zero extras, this “25th Anniversary Blu-ray” offers a nice selection of materials. 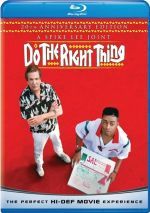 These open with an audio commentary from director Ernest R. Dickerson, as he offers a running, screen-specific look at story/characters, cast and performances, sets and locations, music, editing, cinematography and related areas. Dickerson provides a completely average commentary. While he touches on an appropriate array of subjects, he doesn’t provide a ton of insights. This means we get a fair look at the film but not one that becomes a great discussion. Four featurettes follow. You’ve Got the Juice Now lasts 19 minutes, 12 seconds and includes notes from Dickerson, producer David Heyman, and actors Omar Epps, Khalil Kain and Jermaine Huggins. “Now” looks at the project’s origins and development, casting and performances, and the film’s original ending. Some of this repeats from the commentary, but we still get a good collection of notes here. With The Wrecking Crew, we get a 23-minute, 44-second piece with info from Dickerson, Kain, Huggins, Epps and Heyman. Here we get more insights about the cast and their performances. Again, some of this becomes redundant, but enough new thoughts materialize to make it worth a look. Sip the Juice lasts 12 minutes, 51 seconds and features Dickerson and circa 1992 comments from composers Hank and Keith Shocklee, EPMD, Cypress Hill, Tammy Lucas and Eric B. “Sip” examines the movie’s music and offers a pretty decent overview, though it’s a shame we don’t get modern comments from the musicians. Finally, Stay in the Scene goes for 22 minutes, 43 seconds and provides a 1992 group interview with Epps, Kain, Huggins and actor Tupac Shakur. They discuss their auditions as well as aspects of the shoot and their performances. A handful of minor informational nuggets emerge but mostly the actors just laugh and mock each other, so don’t expect much. A Photo Gallery completes the disc. It offers 41 stills that mix shots from the movie and behind the scenes images. This becomes a decent compilation. As a movie, Juice ends up as a bit of a dud. However, Tupac Shakur’s confident and creepy performance almost saves the day. The Blu-ray presents very good picture along with workable audio and a fairly informative batch of bonus features. Juice remains a spotty movie, but this Blu-ray brings it home well.